The death toll from a powerful earthquake in Nepal has risen to 5,057, and a total of 10,915 others were injured, said the Ministry of Home Affairs Tuesday. The home ministry said that around 454,769 people were displaced. The 7.9-magnitude hit Nepal at midday on Saturday. The quake has also caused property damages worth billions of U. S. dollars. Rescue personnel work on debris in Kathmandu, capitol of Nepal, April 28, 2015. 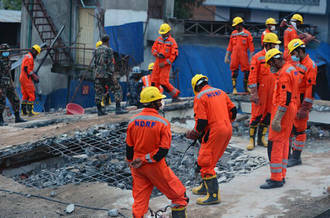 Members of search-and-rescue teams from China, Indonesia and Nepal made efforts together for about 20 victims under the collapsed buildings here.